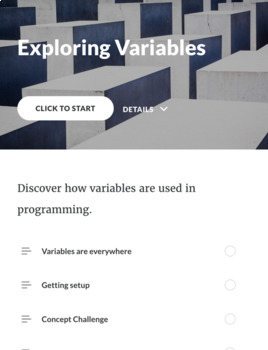 This tutorial engages the student in learning how to create and use variables in computer languages. 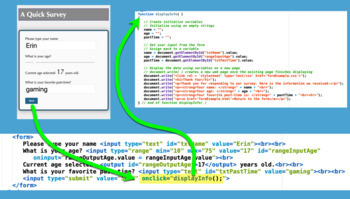 Use this learning activity in your web development and Intro to Programming courses. The lesson is designed for beginning programming students and does not require a strong math background. 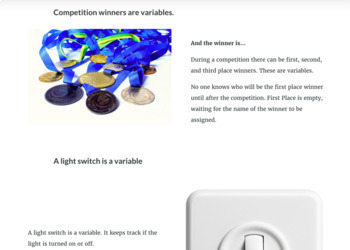 -- Give examples of every day objects that are used like variables. 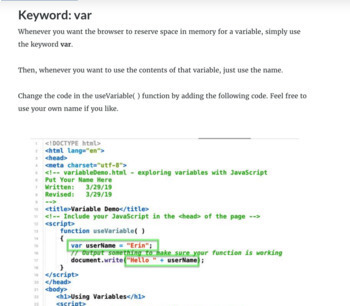 -- Create a variable using the keyword var. -- Initialize a variable using the assignment "=" operator. -- Describe when to use the keyword var as well as when that is redundant. A case study and code walk through is included giving the students a sense of how variables are used. The case study involves a basic form and a feedback page showing the user's input. -- Both PDF and HTML (embed in your LMS) formats are included. -- 14 question quiz bank in Moodle .gift format. -- Start and Final source code files that can be used with the tutorial. Important: This tutorial requires basic knowledge of HTML and using a text editor to create a simple web pages.